CLICK THE HIGHLIGHTED SONGS!! to listen to the hit title track, The Invitation, from Joseph’s newest CD release, his first studio CD album in years. Brand new contemporary jazz songs collaborated with pianist, Joel McCray. A combination of some very funky tunes and some sweet ballads. YOU WILL WANT TO ADD THIS ONE TO YOUR COLLECTION!!! The Title track climbed the jazz charts to #32!! Songlist includes: Shout Out, Some Other Time, Jewel of The City (click the link to hear this selection), The Invitation, Where To Now?, I Owe You All of Me, In Season, Amazing Grace & Funky Shout! Smooth and subtle. 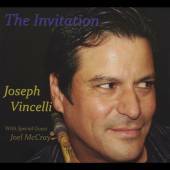 Those just might be the most defining words I’d use to describe this latest effort by veteran saxophonist Joseph Vincelli, The Invitation. Honestly, nothing here is super funky (well, there is the nicely grooved finale). Nothing may rattle you to the bone, but, in listening, you ask yourself: Does it always have to be that way? This is solid contemporary jazz played by an artist who has known the music for 17 years, written a book about music, and regularly teaches music classes. I think he might have a feel for the art form. Wouldn’t you? Here are nine nicely done tracks, including a truly noteworthy and innovative interpretation of “Amazing Grace,” complete with some well-placed scatting by keyboardist/vocalist Joel McCray, a bright addition to this project, overall. Vincelli’s skills on sax are sharp and tight with telltale jazz runs that add the “moments” to this album that help it to be what it obviously strives to be: Quite noticeable. Factors that help to break the monotony of any album, in my opinion, are direction, originality, melody, and some great hooks. In addition to the great interpretation of “Amazing Grace,” tracks like “Jewel of the City,” the title track, “Where To Now?,” and “In Season” do that for this CD.